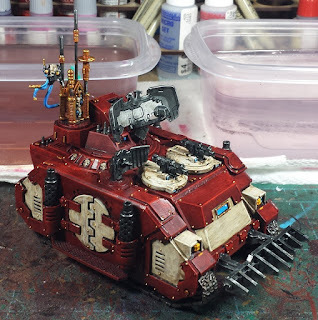 Mordian 7th Regiment: Heresy Era Thousand Sons - Damocles Command Rhino off the showroom floor, and dabbling with Deathwatch. Heresy Era Thousand Sons - Damocles Command Rhino off the showroom floor, and dabbling with Deathwatch. Not a huge amount of hobby time over the last week, though I did manage to get the Damocles painted up to the initial sealant stage prior to the application of waterslides and weathering. Almost to the finish line! 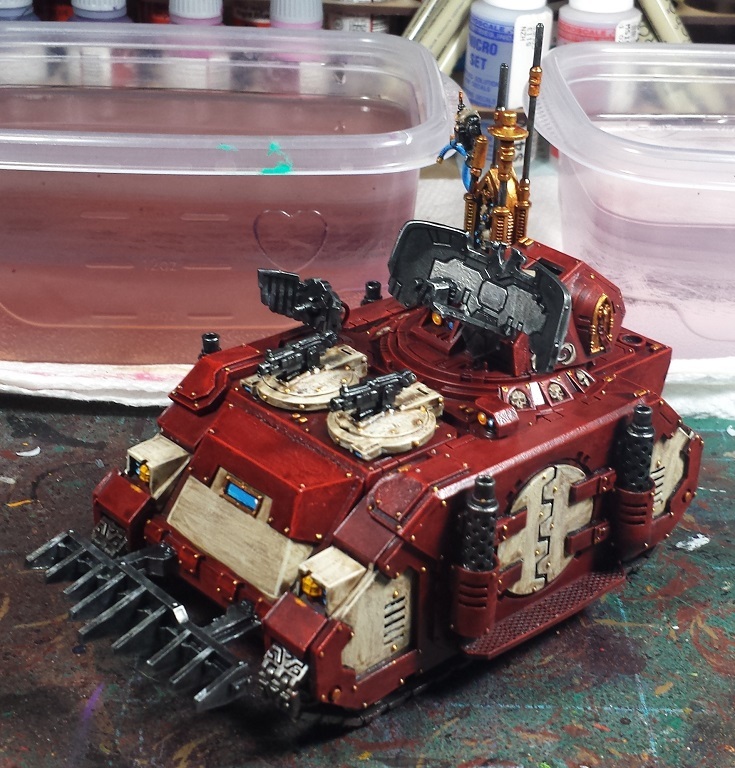 Tried to downplay the aquilas a little as broadly speaking they were vary rarely worn during the heresy, but I figured on the command tank it's not totally out of place. Tons of little rivets of course - I shudder to think how many rivets I've painted for this army already and weep to think how many more remain to be done! In what is an entirely different kind of heresy, I picked up the new Death Masque box set and the Deathwatch codex. Before tearing into the new models I wanted to do a few test models, so I built up a trio of Space Wolf terminators (as I intend 3 5-man terminator squads) - if I muff the paint scheme it'll be okay, it's just some Space Wolves. Haha! Death by rivets. I'll never go near Orky machinery again. Looking great as always! I love your rich colours. Liking the command Rhino for sure. Want to see the force together now! The rhino CP looks great, is there even any room for decals ? 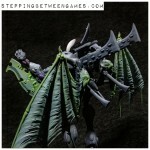 The command Rhino looks really fantastic - I love the shading on the deep red, & that bone white contrast. @Greg Hess: Indeed - the last guard army I'd done truly got out of hand, rivet-wise! @Rob Hill: Har har! Thanks man! @Rory Priest: Family photos to come, will be laying out and shooting the various iterations of the force that'll be making the trip out to NOVA! @Zzzzzz: Hah! Too true, started the transfers last night and ran into that exact issue. Big nova on the rear hatch, and a couple little cartouches but that's about it! Loving the paint job on the Command Rhino! @Alpha Omega: Thanks very much! Comman Rhino came out great! Can't wait to see what you do with the Deathwatch.